After a slow summer, ready to get blogging more again–including some simple recaps of good food and wine experiences. Last night I put together two simple dishes based on cilantro and lime together, for one tasty meal. Now, I don’t get credit for either recipe–but should get some props for putting them together, especially on a Monday night after a long day of training. The Farfalle with Feta and Chipotle is a regular weeknight go-to dish in our home. It has a lot of flavor from the cilantro, lime and chipotle sauce (no cooking required for the sauce); balanced by the rich feta and crunchy pumpkin seeds. We often have this farfalle as the main course along with a salad, but thought it would also go well with the Cilantro-Lime Chicken with Avocado Salsa. The chicken gets marinaded very briefly in a cilantro & lime juice concoction, then is topped with the tasty avocado and tomato salsa. I don’t know if it’s every kid’s cup of tea, but our five year-old loves the combination of cilantro and lime combination. And we were definitely on the same food wave length this week. At Whole Foods, I had him smell the cilantro to get his distinct aroma. He took a deep breath, and said, “When are you going to make that chicken that has this on it and is dipped in the lime juice?”…His lucky day, that’s what I was getting the cilantro for! I guess I passed on to my son the appreciation for the fresh, clean flavor of cilantro and lime together. I definitely enjoyed these two dishes together, along with a side of sauteed spinach. I realize though that featuring it prominently in two dishes on one plate might not work for all; if you’re just a mild fan of these ingredients you might just pick one of these to try first! 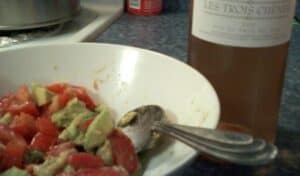 Wine pairing: I had to pause to consider what would go best with the avocado salsa, I thought that would be the toughest element to match. After getting the ingredients for this meal, I headed to the Saturday tasting at Pairings and sampled a delicious little Rosé, Les Trois Chenes, produced by Sas Gerard Duffort, just north of Provence. As I suspected, this Rose was a good match for the lively flavors of the meal. It has a gentle fragrance, with a floral element to the taste along with peach fruit. And it’s a steal at $10, never mind the discounted price at the tasting! And I will definitely be stealing your wine idea!